School holiday is here and wondering where to bring your children to ? If they are the fans of Thomas & Friends, then come to Blue Concourse in Sunway Pyramid to experience an adventure at the World of Sodor. Children will get up close and personal with Thomas and his Island of Sodor friends on 7 - 12 Spetember. The World of Sodor is inviting all little engineers and parents to embark on a story-telling adventure with Thomas & Friends. Me and my Little Angels had joined the adventure last weekend. As every child's best friend, Thomas and his engine friends had helped children around the world to grow and learn through life lessons on friendship, courage, problem solving and teamwork. The World of Sodor features a giant immersive Island of Sodor installation featuring Thomas & Friends adventures and the five valuable life lessons took place. It is a fun-filled family experience which include story-telling and unlimited play with Thomas & Friends track sets. "Here at the World of Sodor, children can watch, listen, learn and play out these life lessons in their own imaginative train play. At Mattel, we believe in inspiring the wonders of childhood. For years, Thomas & Friends have ridden their way into the hearts of children around the world, inspiring imaginations and teaching life lessons. We hope that all the little engineers can have a great time with their favourite blue engine friends at the World of Sodor," says Pinky Fong, Head of Marketing, Mattel Southeast Asia. 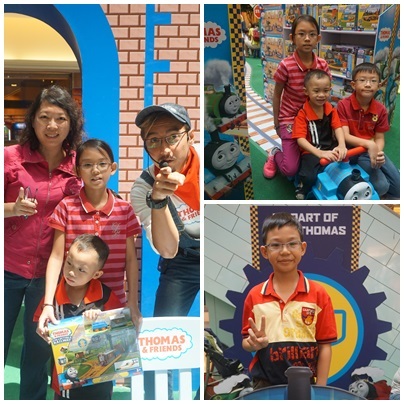 For purchase of any of your children's favourite track sets at the World of Sodor worth more than RM90, you're entitle to bring home a Limited Edition Thomas & Friends Wold of Sodor Giant Play Board and with the same receipt, you'll stand a chance to win a complete World of Sodor track set exhibited at Sunway Pyramid. Wow... A great prize to be win. The Limited Edition Thomas & Friends World of Sodor Giant Play Board promotion is available nationwide from 1 September to 31 October 2016. Exclusively at the World of Sodor at Sunway Pyramid from 7-12 September 2016, any purchase made from RM150 and above, you're entitle to bring home a Thomas & Friends Mega Blocks set. For more information, please visit Thomas & Friends' Facebook page at www.facebook.com/thomasandfriends and Sunway Pyramid's Facebook page at www.facebook.com/sunwaypyramid. Looks like such an awesome time the kids had. I always love educational + fun activities for children. Emily, I love it too since they can learn something while having fun. Miera, Thomas & Friends are every boys' favourite toys but it will be a great remembrance for them when they grow up. Waa a good activity for all the kids to play =) The kids are surely having fun! Sharon, my kids love it since so many toys are there for them to play with. They can even ride on the train. This is perfect for kids who love Thomas and Friends!! Carmen, indeed it is. Lots of merchandise to choose from. i went to the event last week. many toys are selling there. my sons love it! Shirley, thanks for the compliment. As a mother, we will always provide the best for our kids. Aww.. I miss this wonderful event... My nephew loves thomas and friends..
Ivy, wow... She should go here instead and I'm sure she will love the event.